Pregnancy is a natural part of a woman's lifecycle and as such she should not be viewed as if she has an illness or disease. The minor discomforts of pregnancy are considered a normal part of pregnancy, however to the pregnant female, they do not always feel minor at the time and some can make pregnancy very uncomfortable and distressing. The benefits of Reflexology ~ Reflexology can assist in easing many of the common discomforts of pregnancy such as backache, fatigue, oedema and constipation. Obviously any obstetric or medical problem needs to be treated by the appropriate experts. The balancing and harmonising qualities of reflexology can support the woman's ability to shake off the effects of morning sickness. Triggering an early labour ~ Reflexology is a natural therapy and cannot and will not cause the body to do something unnatural. However there are some acupuncture/accupressure points that are traditionally contra-indicated during pregnancy. The chance of accidently touching these specific points is not dangerous to the pregnancy as these points need precise continual pressure to potentially have any effect. How many sessions are recommended? 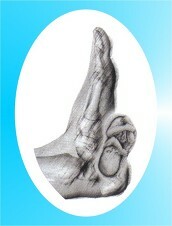 ~ It varies with each individual and a weekly reflexology session would be excellent expecially in the last six weeks. Research and feedback from many maternity reflexologist practitioners shows that women who regularly receive reflexology in pregnancy appear to have more chance of normal labour and childbirth and fewer requirements for medical pain relief and caesareans. Accupressure is a wonderful adjunct to having Reflexology treatments throughout pregnancy. It is based on the ancient Chinese Meridian System which is a series of channels that carry chi (energy) through the body. These meridians contain over 600 points. In balancing and restoring the body's energy, through sustained application of pressure with fingers, thumbs, knuckles or elbows, it promotes changes to improve the body's functioning. By applying sustained pressure to specific points, it can promote the release of endorphins, block the pain receptors to the brain, help dilate the cervix, and increase the efficiency of the contractions. It also helps with afterbirth pains and 'let-down' of milk for breastfeeding. It is a non-invasive, accessible, effective, safe, birthing tool for mid-wives, and can be taught to the pregnant woman and the support person to enable them to take an active role in the labour. Since 1998 research has been published in peer-reviewed journals on the effectiveness of acupressure in pregnancy and labour, resulting also in less medical intervention. Optimally, couples should be taught how to administer acupressure from about 36 weeks gestation (though without pressure), so that they feel competent in finding the specific points at the appropriate time. For the maximum benefit to be gained from acupressure, it is important that the use of these points are commenced as early as possible. Women reporting the highest satisfaction began using the acupressure points at the beginning of their labour. It is important to find a Reflexologist that you feel comfortable with by around the 4th month of pregnancy. This will give you the best chance at utilising the full benefits that Reflexology can bring to the discomforts of pregnancy. He/She can also show you the Labour primer points which should be commenced around 2-3 days prior to medical induction. For cost of consultation & treatment please contact me for individual requirements.